Justin Gaethje celebrates after his knockout victory over James Vick in their lightweight fight during the UFC Fight Night event at Pinnacle Bank Arena on August 25, 2018 in Lincoln, Nebraska. (Photo by Josh Hedges/Zuffa LLC/Zuffa LLC via Getty Images)" align="center" />From top to bottom UFC Fight Night Lincoln did not disappoint, lighting up the Pinnacle Bank Arena with incredible knock outs, beautiful submissions and down to the wire contests. These are the UFC Fight Night Lincoln Talking Points. 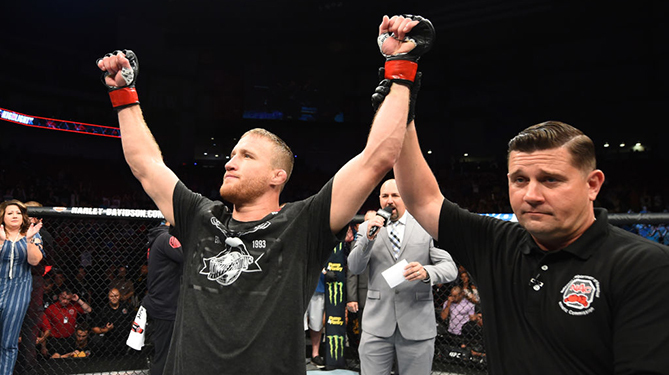 What’s next for Justin Gaethje? With the trash talk heating up and the anticipation rising, we knew the main event between Justin Gaethje and James Vick was going to be good. But oh my goodness. The entire arena lost its collective mind when Gaethje hit Vick with a devastating overhand right that sent Vick crumbling to the canvas unconscious less than a minute and half into the fight. And much to the delight of the MMA world and to the crowd in Lincoln, “The Highlight” followed-up his jaw dropping performance with equally captivating back-flips. So what’s next for the man who perfectly lives up to his nickname? The lightweight division is probably the deepest division in the UFC with big name after big name stacked all the way through the top 10. The division will have a little clarity after UFC 229 when Conor McGregor makes his highly anticipated return against champ Khabib Nurmagomedov and Tony Ferguson takes on Anthony Pettis. And since Gaethje already fought and lost to both Dustin Poirier (taking on Nate Diaz at UFC 230) and Eddie Alvarez that leaves him with only two fighters ranked ahead of him who are currently looking for a fight: Kevin Lee and Edson Barboza. Neither fighter has fought since their match-up at UFC Fight Night Atlantic City in April. In fact, after Gaethje put Vick to sleep, Lee took to Twitter to let Gaethje know that a fight between the two might be money. While he looks for a new opponent Gaethje will also likely keep training, just in case someone in the lightweight division is forced to withdraw from the currently scheduled bouts. Regardless of who it is that stands across from him in the Octagon, we know the next fight featuring Gaethje will be one to remember. Fight fans were in for a treat Saturday, as the Lincoln fight card started off fast and never stopped. Nine, yes nine of the 13 fights concluded with a finish. The night started off with a heel hook submission by Rani Yahya, hit its stride with five finishes stretching from Cory Sandhagen’s comeback win to Bryan Barberena’s TKO halfway through the main card. The two most emphatic finishes of the night belong to Gaethje and to Eryk Anders, who was in a dog fight with Tim Williams until an insane head kick finished the fight with just 18 seconds left in the fight. Overall the night was something that the fight fans of Lincoln will never forget. Moments after being defeated in his home state, Jake Ellenberger decided to call is a career. Ellenberger’s 46 fights, 21 of which happened inside the Octagon make him a legend of the sport. During his time he went to war with some of the toughest fighters in the sport including Carlos Condit, Diego Sanchez, Rory MacDonald, Robbie Lawler, Kelvin Gastelum and Stephen Thompson. Setting the gloves down wasn’t an easy choice for Ellenberger, but after losing nine of his last 11, the Nebraska native knew it was time to ride off to the sunset. What an incredible career from a true pro.